Discussion in 'Luthier's Corner' started by Taylor Livingston, Mar 20, 2003. My 10-string, doubled five, bass is now in Phase 1.5 - design (phase 1 being "I want me a 10-string"). The builder/consultant will be TB's own Patrickj. These specs are not final; while they have been thought about quite a bit, they are not frozen. And, some aren't even there. Bridge: undecided. Check out the Setup forum for my thread "Recommend a ten string bridge?" - if you have any suggestions, they would be welcome. *[edit:forgot to add footnote for the *] Patrick suggested that, rather than carbon fiber and/or 2 truss rods (as were originally planned), he use 1 truss rod and strips of aluminum (the aluminum being placed, as I undertsand it, on either side of the truss rod). I have no experience with this; have never heard of it, but he says it's strong and lightweight, and I'm sure he's right. I'm very excited. Hopefully, Patrick will chime in here from time to time. Any comments are welcome (except "ESP-style basses are ugly"). Let me know if I forgot something, I was a little rushed because of having to type it twice. edit: I worked a little on the picture, to get some little stuff closer to perfect (I doubt anybody'll notice the difference). I didn't look at the picture. Like you said, it's your bass. But you'll have fewer problems with the attachments if you save them as JPG or PNG. They are much more compact file formats. You didn't look at it because it's my bass? How might I convert a bitmap to jpeg? In Paint, do File -> Save As.. and in the lower drop-down, "save as file type", pick Jpeg or PNG. Alternatively, you can open the image in MS Photo Editor, and do the save as... there, which will allow some additional adjustment in picture quality vs. file size. I didn't look at it because my browser won't display it. What I meant was that it doesn't really matter that I didn't look at it, though, because it's your bass. Well, thanks, guys. Any comments? The circles, by the way, aren't a design feature, just needed them to make semi-smooth curves. Is it possible to do carves like that when using a laminate top (1/4")? Will the carves just have to be very shallow? Patrick suggested using a wooden bridge that he would make, with the strings going through the body. I don't really think this will work, though, since the octave strings will have to have very different intonation than their respective primary strings. I'm considering something akin to Michael Manring's 10, which has a clamp on the headstock that holds the ball end of the octave strings, and tuners for the octaves at the bridge. I don't really think this will work, though, since the octave strings will have to have very different intonation than their respective primary strings. I've always wondered about this. Any 8-string bridge I've seen used a common saddle for each octave pair of strings. Which would open itself up to intonation problems, I guess unless the pairs were very carefully chosen. I'm considering something akin to Michael Manring's 10, which has a clamp on the headstock that holds the ball end of the octave strings, and tuners for the octaves at the bridge. I remember considering a BC Rich 8-string that worked the same way. Guitar tuners at the bottom. Shallower than the laminate thickness if you want only laminate showing, or deeper (like the way your picture looks) for a two-tone effect of exposed body core. Paint won't let me save a bitmap as a jpeg... maybe an earlier version (I have Windows 98, non-second edition)? If someone could help me put these up in jpg, I'd be very grateful. Here's an idea of what the shape will look like with the Goncalo Alves top. I tried it with the sides in ash and the center with the Goncalo, to get the "two-tone" look - didn't like it at all. I think the carves on a real ESP are shallow enough (they look deeper in that picture than they really are - lighting) that I can get the carves and still have just the Goncalo showing. The headstock with Goncalo Alves. I've done a little polishing on the body shape, but I'm not going to post it, because I don't think anybody cares. I think I've figured something out for the bridge. And, not only does it solve the bridge problem, it allows me to use guitar strings as the octave strings (which is pretty cool - they're cheaper, and there's a wider variety). It will have an 8 string bridge (EEAADDGG) - probably the Schaller - and a custom wood and synthetic bone bridge for the two B strings. The primary E, A, D. and G strings will anchor in the bridge, as normal. The octave strings and the primary B will go through the body. The B will anchor in a ferrule. The octave strings will go to tuners in a cavity in the body. The ball ends of these will anchor in a clamp on the headstock. I'm hoping that Patrick can do this; it seems (to my brain that's never made a bass) do-able, and not too hard, but I don't know for sure that it can be done. Picture is included, since I'm sure you guys are confused. and it's a jpg! It's a viewer with basic editing functions, including resizing and format change. Thanks, but I just got MGI Photosuite. It works about as well as paint (a little more sophisticated, as you might imagine, but harder to get the hang of), and can save in jpg. I did that drawing above with it. Got the wood (actually Patrick got the wood). Sure has taken long enough! Larry@Gallery said he went on a buying trip right after I placed my order, and there was a long shop line ahead of my stuff. I love the wenge. Stay tuned, I've got pics of the cocobolo board, and GA top. Gotta get offline right now, but I'll put it here later tonight. Turned out very different than I expected. Cocobolo can look so different from piece to piece. 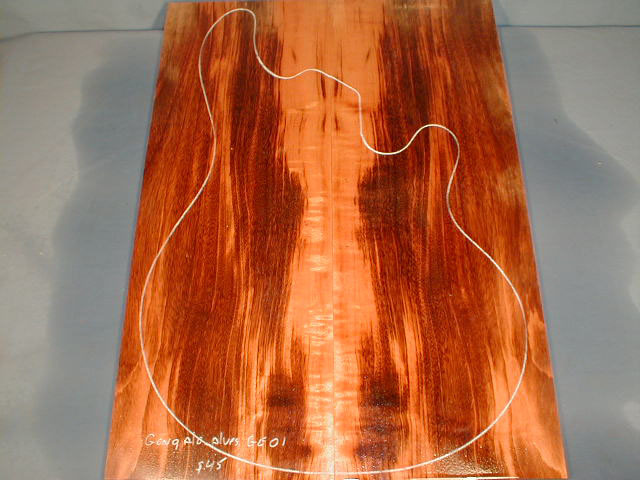 The goncalo alves. This one is completely unlike the original one I had wanted. I'm thinking about whether I want to keep it. At first, I really didn't like it, but I think I do now. I guess it's a good idea to pick out wood in person, when you can, though that wasn't possible in my case. This supposedly has "plum pudding" figure, which is hard to tell and seems to be unspectacular. But still a pretty piece of wood. Ohh I love the "in progress" bass stuff, I'm gonna subscribe to this one. Hmm. I can't really tell if you're being facetious, but if not, thanks! I'm glad somebody's interested. I, too, love the in-progress threads. The tuner-in-the-body thing: most probably scrapped. It was too complicated, and not really implementable without lots of other things redone. The octave tuners will be on the headstock. The scale is now 32". This is so that we can still use guitar strings for the octaves, and have the tuners on the headstock. The bridge is not totally planned out - Patrick has been working on wooden bridge designs for his own basses, and, hopefully, this will work for mine. Tuning: originally B-G, now E-C. I don't think the low B on a 32" scale would be usable, and, as I'm more of a soloist right now than an ensemblist, higher works better than lower.